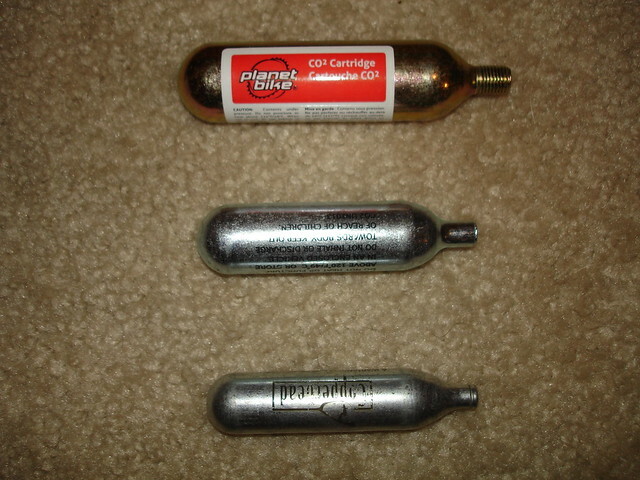 Mark from Planet Bike sent me some of their new 25g CO2 cartridge refills a couple weeks ago to try out. PB introduced the 25g cartridges at Interbike last year, and they were so popular that the company started selling twinpacks of them. Bike tires are getting bigger so our C02 inflation cartridges are rising to the challenge. 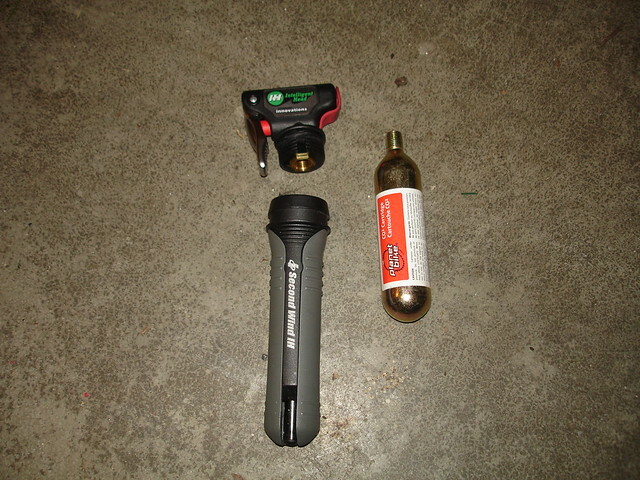 Planet Bike’s new 25 gram threaded CO2 cartridge is the right tool for the job when it comes to 29ers and cross tires. It packs enough punch for two large volume tires. 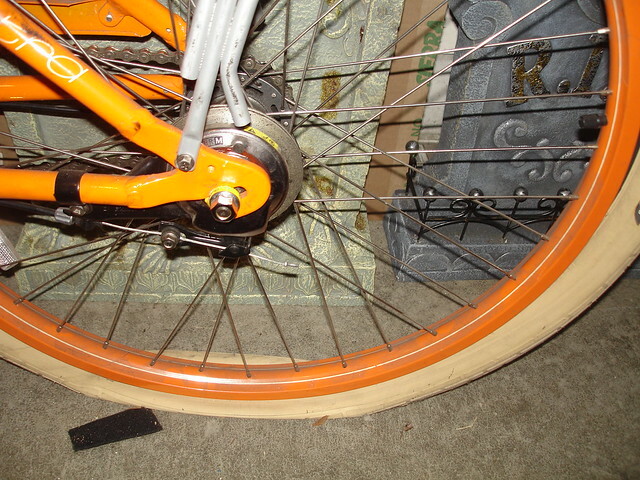 You can’t prevent the untimely flat, so you might as well be prepared to fix it fast. 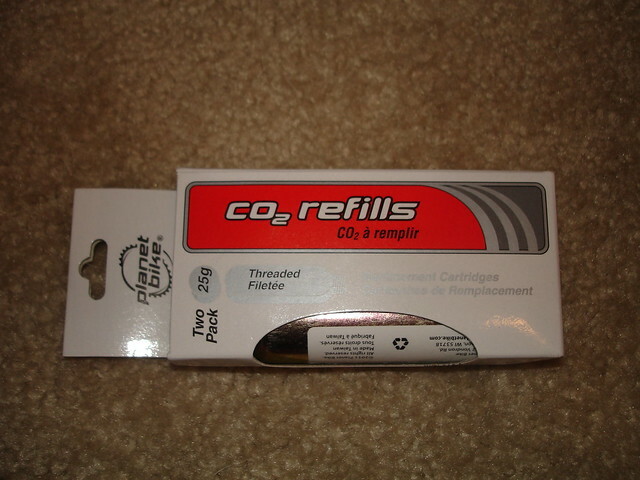 We offer the 25g CO2 in a single pack (with insulator sleeve) and in our new 2-pack! As PB states, these cartridges are suited for higher-volume tires…something I’m sure many of us commuters can appreciate. Here’s a comparison shot of the 25g cartridge next to a standard 16g unthreaded one (in the middle) and a “Copperhead” unthreaded 12g cartridge at the bottom. The 12g is currently my favored size because it fits completely inside my inflator, and because I can buy a 12-pack of them for about the cost of 2 16g ones (the 12g carts are sold for use in BB pistols). When you’re faced with filling a big tire like a cushy 38C touring tire, a DH monster or a fat ‘cross tire, 12g carts just aren’t going to do the trick. Starting from a dead-flat tire, the Planet Bike 25g cart worked like a charm! I even had to stop to correct an escaping tube, bleeding off some pressure from the valve stem and reattaching my CO2 inflator “mid stream”. The 25g cartridge had plenty of oomph left to finish the job even after my screwup. So there you have it…need to fill a high-volume tire on the go? You could carry a handful of smaller cartridges or just one of these mini-SCUBA tanks from Planet Bike and be on your way in no time! One word of caution, though: these cartridges get FROSTY in a hurry. Wear a glove or keep a spare piece of innertube in your saddlebag to cover the steel cartridge, or it will freeze to your bare hand. Looks like PB has another winner on their hands! A twinpack retails for about $21, so they’re not cheap, but they are competitively priced with other cartridges on the market. And remember, you only need one to get the job done. $10 to inflate a tire!?! How about $40 and get yourself an excellent mini pump. I’ve been using the Topeak Road Morph (w/ gauge, even) for years, and LOVE it. 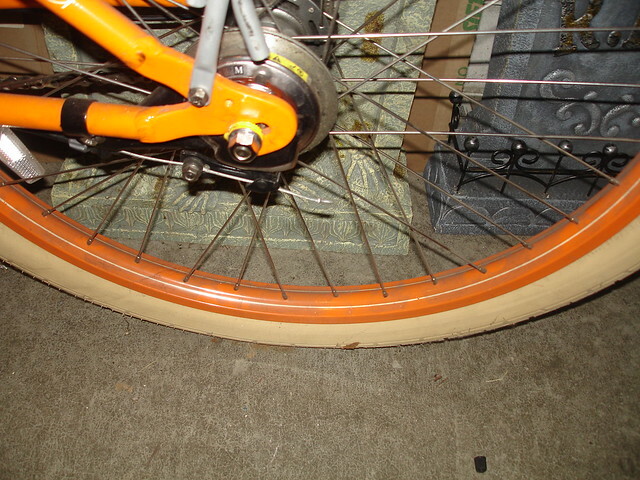 Works just fine on anything from the monster tire on a Pugsley at 8psi to a skinny road bike tire at over 100psi. I generally just don’t understand CO2 use, unless you’re in a darn important race and just don’t have the time to pump (which really, doesn’t take that long). Ian, have you ever tried to pump a high-volume DH tire with a mini pump? Frankly, I’ve got better things to do with my day than push a little pump 400 times. I’m totally with Ian. I don’t understand why CO2 has taken off. Has anybody ever done a comparison of how long it takes to pump up a tire by hand vs. how long it takes with a CO2 cartridge? I’m guessing it’s not much of a difference. 3 minutes maybe? 4? Well, with my highest volume mini-pump (I have several to choose from), I can get a road tire to riding pressure in about 120 pumps, about 200 to fill a large volume MTB tire. That takes 3 or 4 minutes. 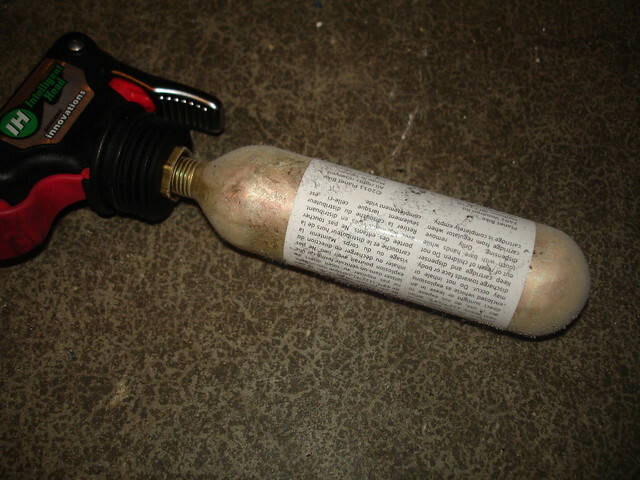 A CO2 canister takes about 5 seconds to fill either tire.